Justen Vrabel, SGA’s executive vice president, recently started a student fan club called the Yo Show. 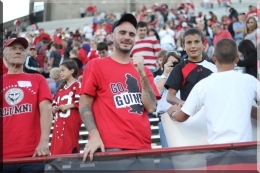 Photo by Dustin Livesay/The Jambar..
Justen Vrabel, the Student Government Association’s chief of staff, wanted to create a group for students passionate about YSU sports. Yo Show was the result. Vrabel said that Yo Show has lived up to its expectations, and that turnout for the YSU football game at the University of Pittsburgh surpassed expectations. Vrabel said he hopes to keep Yo Show growing as an organization and slowly expand it into other sports. “There’s no reason why YSU can’t have big student sections,” he said. Along with having tailgates before all of the home football games, Vrabel also hopes to get groups together for a volleyball match and a soccer game. “It’s more difficult to get people to come to these events, so we need to publicize them first,” he said. Joe Mikolay, an SGA representative for the Williamson College of Business Administration, assists Vrabel with promoting Yo Show. He said they expect to have large student sections at the men’s and women’s basketball games. “Having everything organized is the key,” Mikolay said. “We’re going to have coordination and cheering leaders to have the student voice be heard.” Yo Show has been working closely with athletics, and the increased support has been noticed. “Faculty and advisers thought something like this was long overdue,” Vrabel said. Those wary of coming to the tailgate are encouraged to keep an open mind and give it a try. Kingsley Ansah, a senior at YSU, attended his first tailgate for this past week’s football game. Senior Patrick Shelton is a regular at the tailgates. While the results have been good so far, Vrabel said there is room for improvement. “There’s growth to be had at the home tailgates,” he said. As for Saturday’s football game against the University of Northern Iowa, Vrabel and Mikolay are excited for the prospects. “We need to help the team out and show them we’re there for them,” Vrabel said. The tailgate lot will open at 1 p.m., and kickoff is set for 7 p.m. Yo Show is located under a red and white tent at the far end of the M-7 parking lot. Students are encouraged to spread the word.